Do You Run a Mission-Critical Setup or a Heavy Database-Driven Dynamic Site? Hardware matters! Solid-State Drive (SSD) speed benefits any workload that requires a lot of reading and writing to storage, like a database for instance. 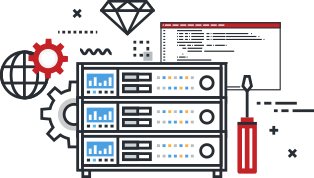 Perhaps you simply want high performance, multi-core, and multi-threaded processors in your Dedicated Server without sharing resources with neighboring sites like you would with other hosting solutions. Fortunately, InMotion Hosting has every plan to suit your needs. We are confident in our services. Therefore, we offer a Full 30-Day Money Back Guarantee, regardless of the Dedicated Server Hosting plan you choose. It seems that Liquid Web's TOS does not include Full Refund returns on Dedicated Servers. It's no secret that a Data Center's proximity to an Internet Exchange Point can dramatically affect your server's ping times. That is why InMotion Hosting Data Centers are located at the Los Angeles and Washington, D.C. Internet Exchange Points. Liquid Web's East Coast data centers are a few hundred miles to the closest Internet Exchange Point. InMotion Hosting gives a generous amount of free dedicated IPs. Liquid Web only gives you one for free. InMotion Hosting includes lightning fast 1Gbps connections on all of our Dedicated Servers. InMotion Hosting gives you full control over your server with cPanel and WHM. Unlike many hosts, we include cPanel at no extra cost! Our fully managed Dedicated Servers come pre-installed with a LAMP stack. Everything you need to start your new server right. InMotion Hosting has partnered with Corero to defend against DDoS attacks that lead to unplanned server outages. InMotion Hosting also has multi-layer, high-bandwidth switches that layer through various scripts and APIs to change the routing within the network itself on demand. All this to ensure you, our customer, stays online. Once again, InMotion Hosting has earned my appreciation and business. As you know, there is a lot of competition out there for web hosting and domain name registration. Time and again I use In Motion Hosting because the level of professionalism, ease to reach an English speaking, American support individual combined with easy to understand, transparent and reasonable fees cannot be beat. Not anywhere. In Motion is always easy to reach for any reason, and tech support when needed is 100% American, competent and responsive. Matt in your sales division was awesome as expected, and I’m on my way to starting our company’s newest website." Have Questions and Need Us to Get Back to You? Researching Dedicated Servers can take time that you may not have. If your need is urgent, Chat Now with our Technical Sales Team. Otherwise, send us your questions and we will get back to you ASAP.